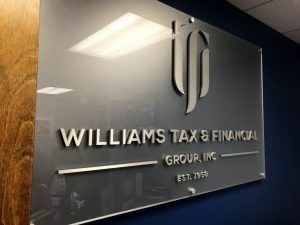 Take a look at this acrylic backer lobby sign we made for Williams Tax & Financial Group in Los Angeles. They were looking to replace an existing lobby sign due to a logo change and they wanted to make sure to get something very high end. When going through a logo change, you want to make sure that all of your branding is consistent. It can look unprofessional if the logo on your website is different from the logo on your other marketing like your signage or brochures. People may even mistake it for a different company. Frosted glass and metallic give lobby signs a very professional and premium look. The way your logo is represented greatly influences how people see your business. Having a visually impactful logo sign in your lobby or reception area makes a great first impression on clients. For a frosted backer panel, we use acrylic as opposed to actual glass. To give the acrylic the frosted look, we apply etched vinyl on the back. This is much more cost-effective compared to the frosted glass but still creates the same aesthetic. Etched vinyl can also be applied to interior and exterior windows to create the same effect. Metal is always a popular choice for lobby signs unless the client wants a specific color. For metal signs, we usually use aluminum as it is lightweight and easy to work with. We can give the aluminum different finishes, and anodize it to strengthen the material and/or add color. If a client isn’t satisfied with just a painted gold finish, we can anodize the aluminum gold so it still has a metal texture. Did your company recently go through a logo change? 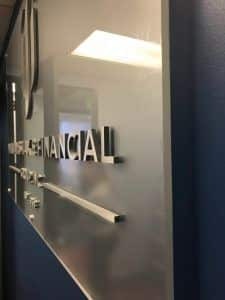 Whether you need a new lobby sign or you’re looking to replace an existing one, we will help you design a sign that will look great in your lobby or reception area.